Duncan Hunter is my Congressman – Argh! Check out this article that describes Hunter accusing constituents protesting at his offices as trespassers. Here is a post about Hunter misusing campaign funds for private consumption of his family. Here is post I wrote in December 2013 about Hunter making moronic statements about Iran. You might have guessed it by now, I am not much of a Hunter supporter, and I can’t believe this man actually got elected to Congress. Maybe I need to run for Congress. There does not seem like much competition. Duncan Hunter is my representative in Congress. When his father, Congressman Duncan Hunter, decided not to run for re-election, his son did and won his father’s seat in Congress. Hunter is a combat veteran from the Afghanistan and Iraq wars. I didn’t vote for Hunter. I didn’t care for his father, either, and I don’t think I ever voted for him. I was in the minority, which I usually am. I always question nepotism. How is it, that Hillary Clinton, the wife of a former president, is suddenly the most qualified person in the country for the presidency? Might it have had something to do with the name recognition? How is it, that George W. Bush, one out of more than 300 million eligible Americans, won the election in 2000? Might it have been for the achievement of his father? 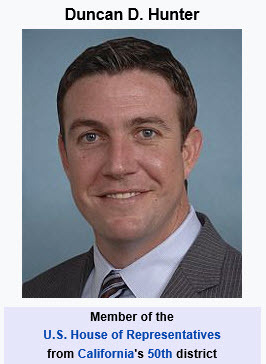 Might it be that Duncan Hunter won the election because voters might have confused him with this father, who after all was a household name in North County San Diego, being a congressman for 28 years, from 1981 through 2009? I guess I don’t know if all voters did their research before they voted for young Duncan. This is the same Duncan Hunter that recently got bad press for ridiculous statements about the border patrol on the Mexican border letting ISIS terrorists into the country. This is not all. But you get the idea. When questioned, his spokesman said these expenses were “mistakes.” Sorry. Seriously? It might not be illegal to use campaign funds for very personal expenses that have nothing to do with the campaign. But mistakes? I can see how you can accidentally charge one such item to the wrong account, by mistake. But how do you accidentally charge a trip to Disneyland, and another to Sea World, to your campaign without knowing it? And how do the accountants that put all this into ledgers just keep doing it without raising the issue? We have a word for this: Corruption. Fortunately, I didn’t vote for Hunter, and I didn’t contribute a penny to his campaign. But I am sure many people did. I wonder how they feel about subsidizing the education of the Hunter kids and their family vacations? This is called “redistribution of wealth,” from ordinary citizens who give money to their congressman for election purposes, to the private slush fund of a corrupt politician who thinks nothing of using other people’s money for personal expenses. And it’s legal. Like the lottery. People volunteer to give their money to these people. To be fair, Hunter has reimbursed the campaign for about $60,000 in the meantime – after he got caught. He had to mortgage his house to do that. I wonder about the expenses of other members of Congress? Can we see them all? Duncan Hunter is my representative, but I am not proud of this. Should we be draining the swamp? I live in the California Congressional District 50 and my congressman is Duncan Hunter. I am totally embarrassed by being even remotely associated with this man. Here he is, telling us that he would be in favor of using “tactical nuclear devices” in Iran. I think a ground war in Iran with American boots on the ground would be a horrible thing and I think people like to toss around the fact that we have to stop them in some way from gaining this nuclear capability. I don’t think it’s inevitable but I think if you have to hit Iran, you don’t put boots on the ground, you do it with tactical nuclear devices and you set them back a decade or two or three. I think that’s the way to do it with a massive aerial bombardment campaign. President Obama has recently unlocked the stalemate we have had with Iran for over thirty years and we’re finally able to THINK about talking with Iran again – what a concept! In this time of right-wing indignation, where the likes of Duncan Hunter are blaming the president for TALKING and are asking instead of using nuclear weapons, we should remind ourselves who Iran actually is. As of 2012, there are over 75 million people who live in Iran. More than half of Iran’s population is under 35 years old, which means the oldest of that half was just born when the American Embassy hostages were taken. Those Iranians know nothing about us that isn’t distorted by the internal regime’s propaganda. I know many people from Iran, albeit all of them from before 1980. Some of those people are still in Iran today and I have no contact with them, of course. But I must say that I have never met an Iranian (or former Iranian) that I didn’t like or respect. Today’s Iranian government may also surprise you. According to this article in The Atlantic, Iran’s cabinet has more members with Ph.D. degrees from U.S. universities than Barack Obama’s cabinet does. In fact, Iran has more holders of American Ph.D.s in its presidential cabinet than France, Germany, Italy, Japan, Russia, or Spain—combined. So let’s face it, we are dealing with a large country, the largest population in the Middle East. The academic credentials of their highest level of government are impressive, and many of them have doctorates from prestigious American Universities. These guys have friends in our society. They have traveled next to us in our airplanes, and they have stood in line behind us at Starbucks. The majority of Iranians are young, under 35, and they want: education, better lives for their children and families than they had, freedom to travel the world, food, shelter and security for their loved ones. That’s what the Iranian people want. All we need to do is wait a few more years until the cranky old zealots all die off and we have a country that we can work with. Duncan Hunter’s moronic statements are so out of touch, I am dumbfounded. How do men like that make it to Congress?